The 2013 Great Food Blogger Cookie Swap!! Yay! I’m so excited! I’ve just received the email confirming my participation in this year’s cookie swap! I should receive the two names and addresses of the Canadian food bloggers to whom I’ll be sending a dozen of my most favourite cookies by this coming Monday. Now, to narrow down the choices for which cookie recipe I’ll be making…. …durnit, this is harder than it sounds; I have literally THOUSANDS of cookie recipes, in books, in Word documents, and online. How do I choose?!? 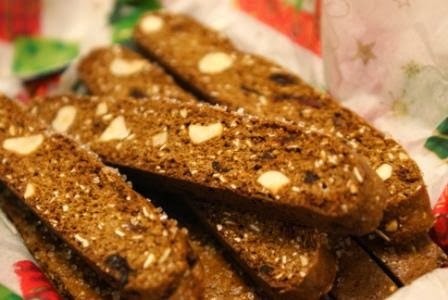 Last year I made the Gingerbread Biscotti shown here, as mentioned before in this post; they are absolutely delicious and one of my favourite biscotti recipes. So, not those. Should I do a Christmas-themed cookie recipe? Or stay away from them since everyone does those? Should I develop a brand new recipe for the swap? That’s always a cool idea. So many choices! I am not allowed to post the recipe in advance of the cut-off date for baking off and sending out the cookies to my chosen bloggers, but I will definitely post as soon as I can!